Summer events are not as far away as we may think when it comes to planning which Ravinia Festival concerts we want to attend. 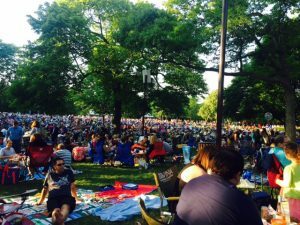 The Ravinia organization just released its summer schedule and it is jammed with pop, classic and rock concerts. So the first question is where to see the schedule. Go to Season at a Glance to print an easy to copy Ravinia program to put on the bulletin board (or into your mobile devise). For an easy to read schedule visit Ravinia. Next question is when tickets are available. According to the Ravinia website, the first opportunity goes to patron and higher donors, March 19–28. Next, affiliate donors have access to tickets April 22–25. Then, tickets are available to Friend donors April 26–28 and Bravo and Encore donors can order Lawn tickets April 29–30. Tickets will be available to the public beginning May 7 for the May/June/July concerts. Then the tickets open for August/September concerts on May 8. Visit Ticket Info. No, you don’t have to plan what to bring now but you might want to decide if you and family or friends are going to try one of Ravinia’s dining-in or take-out options. Finally, print out the schedule or put dates on the calendar so you don’t miss the concert you really want to see. The summer night was a glorious mid 70’s temperature with dappled sunlight filtering through the trees at Ravinia Festival. Picnickers spread their repasts across the grass behind the Pavilion and out across what patrons call The Lawn. The music emanating from the Pavilion was an inspired duo of Leonard Bernstein’s Symphony No. 1 (“Jeremiah”) that opened the program, followed by Mahler’s Symphony No. 1. The Bernstein work was part of Ravinia’s tribute to the legendary composer/conductor on the anniversary of his 100th birthday. Brilliantly played by the CSO and conducted by Marin Alsop, the works were well paired for their religious themes. Both first symphonies contained passages whose roots went back to Jewish ceremonial and folk music and both symphonies contained passages of protest. But where Bernstein’s piece ended with “Lamentation” sung by mezzo-soprano J’nai Bridges, the Mahler concluded with a triumphal coda set against nature sounds originally heard in the introduction that left picnickers happily lingering a few minutes longer. “Wasn’t that beautiful” said Trish who had come with husband Joe from Pingree Grove west of Elgin. “We enjoy just being out here,” she had said earlier after they set up under trees bordering the Lawn. Also coming in from Chicago’s western suburbs were Cindy and Jim from Wayne with Valerie and Steve from Kildeer whom they met at Ravinia a few years ago. “We love it here” said Valerie. 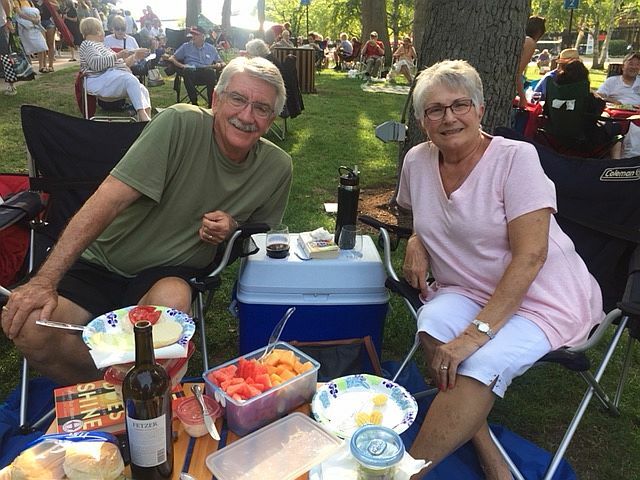 “We try to come anytime the CSO is playing,” said Cindy who added that she and Jim have been coming to Ravinia since 1982. By the way, Sunday, Aug. 19 was the last Chicago Symphony Orchestra concert at Ravinia for the 2018 season. 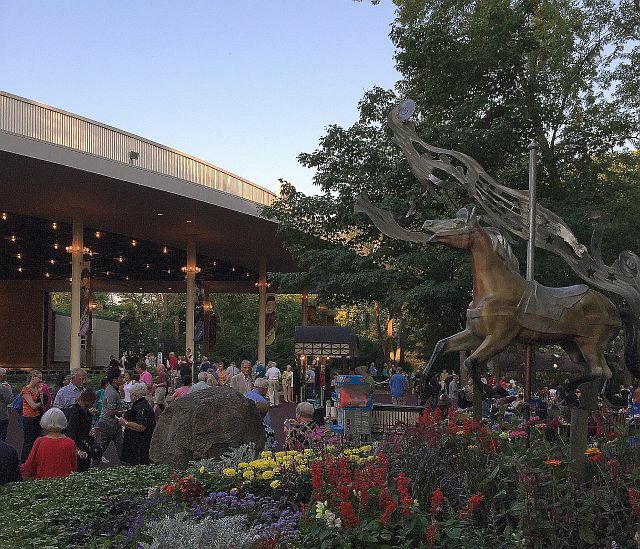 For Ravinia’s program during the remaining season visit Ravinia. The Ravinia Festival is between Sheridan Road and Green Bay Road just north of Lake Cook Road at 200 Ravinia Park Rd., Highland Park. To report that Leonard Bernstein’s “Mass,” performed under the baton of Marin Alsop and directed by Kevin Newbury at Ravinia Festival July 28, received a long standing ovation would merely relate the overwhelming response to this seldom done, lesser known work. 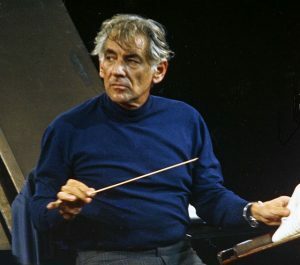 Even though it is an appropriate bow to Bernstein on the anniversary of his 100th birthday, it is hoped that “Mass” will be presented more often. 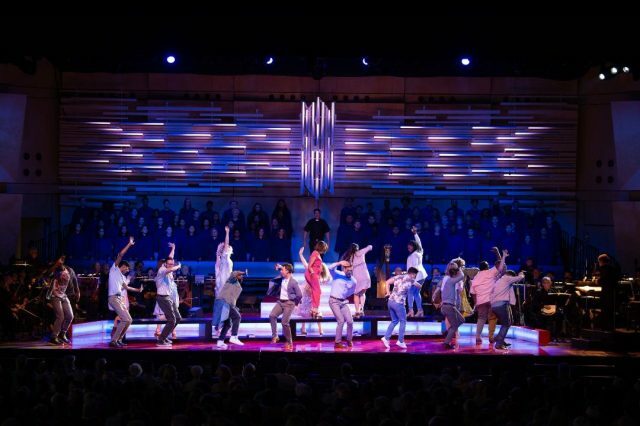 Commissioned by Jacqueline Kennedy for the 1971 Kennedy Center opening, “Mass” goes way beyond a tribute to John F. Kennedy and his religion. As Bernstein’s daughter, Jamie Bernstein, explained during a pre-concert talk Saturday, the work is autobiographical. The music is really a journey that takes the audience from dutiful respect to protest, from moody contemplation to rapture, from disbelief and madness to acceptance and peace. At Ravinia, it was accomplished through the extraordinary interpretation of Brazilian operatic baritone Paulo Szot as the Celebrant. But this is a also a work best performed with several singers, musicians and several talented players. To fill those roles Ravinia pulled in the Chicago Children’s Choir, the Highland Park High School Marching Band and a really fine “Street Chorus” of Sumayya Ali, Aaron Blake, Matt Boehler, John Clay III, Nicholas Cunningham, Alexander Elliot, Erica Everett, Nicole Fragala, Devon Guthrie, Devin Ilaw, Morgan James, Alexa Jarvis, Mykal Kilgore, Meredith Lustig, Timothy McDevitt, Michael Maliakel, Barrie Lobo McLain, Kaitlin Mesh, James Onstad, Michael Preacely, Isabel Santiago and Karim Sulayman. A shout-out has to go to Altar Children Wyatt Parr and Myra Sahal. It was Parr’s “Lauda, Laude” that brought peace to the Celebrant and congregation on stage and wonderment to audiences on the grass who didn’t catch everything happening on stage. However, it was the brilliant interpretation of Bernstein’s conflicting, pensive and joyous mood swings by the Chicago Symphony Orchestra under Alsop that moved the journey along. Sadly, Ravinia’s “Mass” was a one-night experience but there are two more Bernstein programs on the schedule this summer. “Bernstein and Friends” will present songs and arias by Nadine Sierra and Michael Fabiano in the Martin Theatre, Aug. 10 that includes two Bernstein pieces. Then Marin alsop will return to the Pavilion on Aug. 19 with the CSO playing the First Symphonies of Bernstein and Mahler. Ravinia Festival is at 418 Sheridan Rd., Highland Park. For tickets and other information call (847) 266-5100 and visit Ravinia Tickets. For the complete Ravinia schedule visit Ravinia Calendar. Several orchestral works by Leonard Bernstein, the composer popularly known in musical theater circles for “West Side Story” can be heard at Ravinia Festival in Highland Park as part of a world-wide celebration of the 100 birthday of this musical genius (Aug. 25-1918-Oct. 14, 1990). On the Ravinia schedule is “Mass,”commissioned by Jacqueline Kennedy for the 1971 opening of the Kennedy Center. The work will now be making its CSO and Ravinia debut with a star-studded cast, July 28, 2018. Get the calendar out. 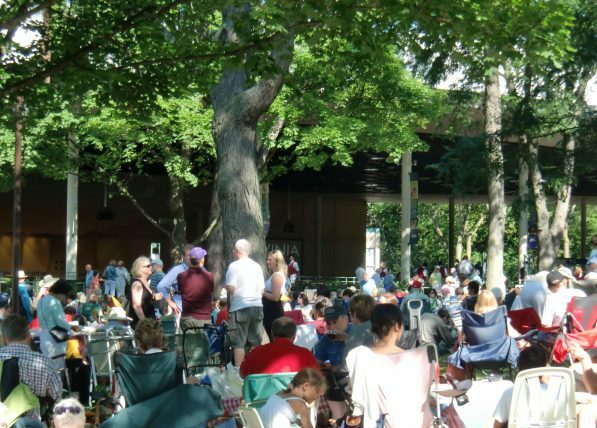 It’s time to plan which Ravinia Festival concerts should be marked down, which ones need tickets ahead of time and which might be good for a picnic on the lawn or a seat in the Pavillion. The 2016 season goes from June 1 through Sept. 16. Donors can get tickets March 20. Tickets will be available to the public May 8 for June and July concerts and May 10 for August and September programs. New this year: There are more programs inside Bennett Gordon Hall and the Martin Theatre. The season will celebrate the late conductor, composer, pianist Leonard Bernstein’s 100 anniversary of his birth and ; the 30th anniversary of Ravinia’s Steans Music Institute (RSMI). And the dining spaces and menus have been redone. Park View, a contemporary American restaurant featuring local and seasonal dishes is upstairs the dining pavilion. Mirabelle is still there but specializes in guest chef and themed dishes. The casual Ravina Market take-out menu has expanded but kept popular dishes. Tree Top will go in where PNC Private Dining used to be and the Lawn Bar with indoor and outdoor seating for drinks and small plates will be located on the lower level, north side of the dining Pavilion. The Freehling Room is still the Donor Dining Club but will add casual fare on pop concert nights. Ravinia Festival Park is at the south end of Highland Park from Sheridan Road on the east to Green Bay Road on the west. But best option is to take a free shuttle from the Ravinia or Highland Park train station. For tickets, directions and transportation options visit Ravinia.org. Enjoy the summer by planning now. Ravinia celebragtes Leonard Bernstein in 2018. Photo by Allan Warren. 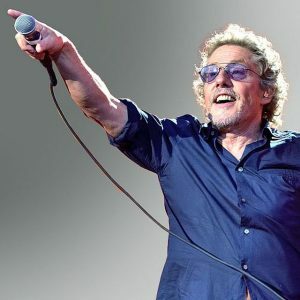 Diana Ross, June 2, Anita Baker June 10, Jackson Brown June 15, Seal June 19, Jill Scott debuts at Ravinia June 22, Roger Daltry and the Who’s Tommy come June 23 and June 25 and Bryan Adams performs June 29. Buddy Guy and Jonny Lang July 8, Zukeerman Trio does Brahms July 11, Joshua Bell and the CSO performs Bernstein “Candide Overture” and “Serenade” plus Tchaikovsky’s “Pathetique” July 12, The CSO and Chorus do Bernstein’s “Chichester Psalms” and Beethoven’s Ninth Symphony on July 14, vocalist Audra McDonald and the CSO do a “Sunday in the Park program for the Ravinia Gala July 15, the annual Tchaikovsky Spectacular is July 22, Misha and Cipa Dichter are in Bette Hall then Leon Fleisher with Katherine Jacobson Fleisher perform Bach and Brahms in the Martin Theatre July 23, Makoto Ozone plays Gershwin’s “Rhapsody in Blue” July 24, Jorge Fredrico Osorio is in the Martin Theatre for the Debussy and Ponce concert July 26, a double Bernstein program starts with a Young People’s concert in the morning then features his “Mass” in the evening July 28. O.A.R. and Matt Nathanson come Sept. 2, Sir James Galway returns Sept. 4, Peter Serkin comes Sept. 5, 50 Cent debuts at Ravinia Sept. 6. 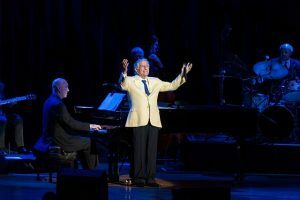 Tony Bennett’s stylish songs are Sept.8, “Considering Matthew Shepard by Craig Hella Johnson with the Conspirare chorus (poems set to music to mark the Shepard murder that ledto the Hate Crimes Act Sept . 12 and Los Tigres del Norte end the season Sept. 16. Clad in signature vanilla sports jacket and broad grin, Bennett entertained cheering crowds inside Ravinia’s Pavillion and around it on the jammed lawns, Friday, a day after turning 91. Tony Bennett wows the Ravinia Festival crowd day after his 91st birthday. Photo by Pedro de Jesus for Ravinia. “I travel all over but this is my favorite place,” Bennett told the crowd. Indeed, Ravinia Festival is where Bennett has been coming on or day after his Aug. 3 birthday. Some were just a few lines such as “Rags to Riches.” Most others were the whole song. He did a great “One For My Baby (And One More For The Road)” with jazz, pop and classical pianist Tim Ray sitting in for this season tour regular Billy Stritch. Ray, who has accompanied Aretha Franklin and Bonnie Raitt and played with Rufus Reid and with the Boston Pops was fun to watch and listen to during solo turns on the piano. The concert wasn’t all pop. Bennett moved to jazz with “Stepping Out With My Baby” with Ray, as Bennett pointed out, in the style of Duke Ellington. The blues feeling came with a gorgeous “In My Solitude” done with Bennett’s long-time guitar player, Gray Sargent. Bennett and Sargent did several songs together as a well-matched pair. Also good to hear were quartet regulars Marshall Wood on bass and Harold Jones on drums in brief shout-outs. But with the last words of what some consider his signature song, “I Left My Heart in San Francisco,” the lights came on and the audience applauded thinking the concert was over. However, Bennett continued the joyous evening with a couple more songs. When it ended for good, the Pavilion audience kept standing and applauding as Bennett left the stage but encores were not to be. Except for short band solos and riffs, he had sung straight through from 9 to 10 p.m. with seemingly endless energy. With such top drawing festivals and names as Pitchfork, Windy City Smokeout and Jimmy Buffett (among several others) filling parks and fields all over Chicago this past weekend, you might think that a north suburban music outpost would not be jammed. Yet Ravinia Festival in Highland Park packed them in for James Arthur, Fitz & The Tantrums and OneRepbulic, Saturday, and its Tchaikovsky Spectacular played by the CSO, Sunday. “Every inch of space and lawn was filled,” said a One Republic fan describing the Saturday scene. 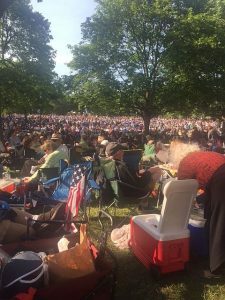 If understandable for the pop rock genre, it might have come as a surprise to classical music lovers that the same was true on Sunday as visitors kept filing in and looking for even a few inches to sit and picnic. The luckier folks, or make that those in the know, staked out their space two hours ahead of Sunday’s early, 5 p.m. concert start. Spread out with a yummy-looking picnic under the trees before the crowds descended were The Nelson family who came from Chesterton and West Lafayette, IN and from Evanston. “We all came last year,” said Wendy Nelson, Evanston. The rest chimed in with “We enjoyed it so much wanted to do it again,” said Laura Nelson, West Lafayette; “You know, Purdue University,” husband Jeffrey said. They were there with parents Eileen and Roger Nelson, Chesterton. “I’m the patriarch,” said Roger. 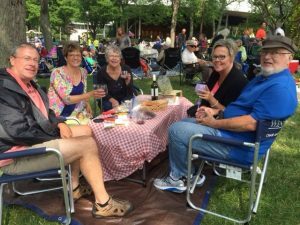 The Nelson family, Jeffrey, Laura, Eileen, Wendy and Roger, arrived at Ravinia early to chat and find a choice picnic spot, Sunday. By 4 p.m. the lawn was a sea of humanity. After the Romeo and Juliet Fantasy Overture, a sterling piano performance of Concerto No. 1 by Simon Trpceskiand and the Francesca da Rimini fantasy, came the 1812 Overture with real cannons in a roped off area. When the smoke faded and the last note played, some people left to catch the Union Pacific North Line train but that didn’t make much of a dent in the crowd that still enjoyed getting together and picnicking on the lawn. “Great concert,” said a guy from Glen Ellyn on his way to the parking lot. Well, there are a lot more chances to come to Ravinia, this summer. 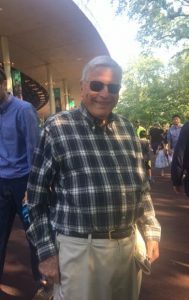 Long time Highland Parker Dan Pierce, a former IL State Representative and former Highland Park mayor, strides outside Ravinia’s pavilion Sunday. The CSO returns July 18 with Yefim Bronfman playing Brahm’s Piano Conderto No. 2. 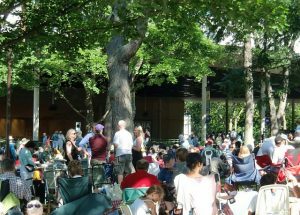 The orchestra which makes Ravinia its summer home, will be back for several more concerts including July 20-21 to play Beethoven and Sibelius programs. BTW, Tony Bennett returns Aug. 4. Hootie & the Blowfish founder Darius Rucker is at Ravinia the next night, Aug. 5. Santana, the famed guitarist of Latin, rock an jazz fusion, is there Aug. 11-12 and heartland rocker/rock and roll hall-of-famer John Mellencamp is coming for the first time to Ravinia Aug. 26-27. Ravinia Festival is at 418 Sheridan Rd., Highland Park. For more schedule information, tickets, prices and parking, call (847) 266-5000 and visit Ravinia. From bike riding to strawberry munching and concerts in a garden to music on a lawn, summer fun is tempting us to find our outdoor muse during or after work. First, don’t be surprised if you see more groups of bikers around Chicago, this week. The annual Bike commuter Challenger is upon us asking people to ride a bike to work instead of a train or car. To participate in its fun events and “pit stops” go to Bikedown to register. Then, for a different way to enjoy a balmy early evening, check out music with a Latin or Swing beat at the Chicago Botanic Garden. Different nights and different weeks feature different musical sounds and bands. For example, Mondays at 5:30 p.m. there are carillon bells and Tuesday, the music shifts over to the Esplanade for bluegrass or big band sounds. Visit Chicago Botanic Garden Evenings for more information. The concerts are free but unless you are a member there is a parking fee per car. 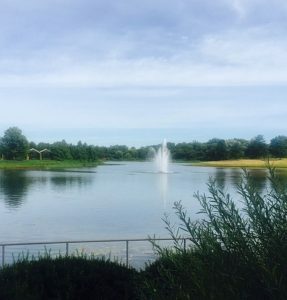 The Chicago Botanic Garden is east of Edens Expressway at 1000 Lake Cook Rd, Glencoe. 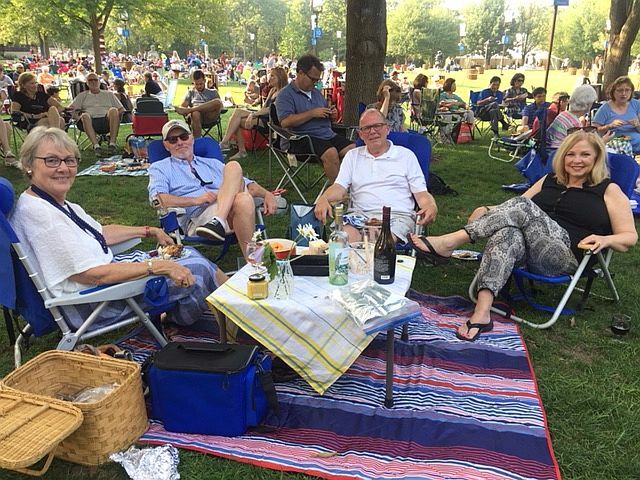 Ravinia Festival’s lawn is a great place to meet friends for an after-work supper. Or get a lawn ticket (best price is ahead of time, not at the gate) to hear perfect after-work music at Ravinia Festival in Highland park. The Julliard String Quartet is June 20. It’s in the Martin Theatre but usually those programs are broadcast on the lawn. In the Pavilion are Gypsy Kings June 23, Common June 24, Michael McDonald and Boz Scraggs June 27 and Diana Krall June 28. For show times and other info visit Ravinia. Long Grove festivals are a chance to see the village. 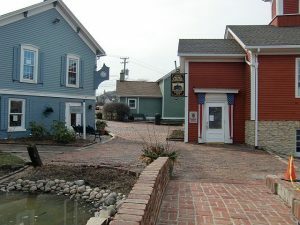 If everything or anything strawberry excites the taste buds, go over to downtown Long Grove, a cute historic village northwest of Chicago, June 23-25. Along with lots of booths with strawberry sandwiches and desserts there will be several music stages and stuff for kids. Entry is $5 anyone over age 12. Hours are 11 a.m. to 11 p.m. Friday, 10 a.m. to 11 p.m. Saturday and 10 a.m. to 6 p.m. Strawberry fest’s center is at 308 Old McHenry Rd, Long Grove. Visit Long Grove for more information. Get out the calendar to mark the 2017 summer music festivals you hope to catch. Copy the ticket info and good luck. 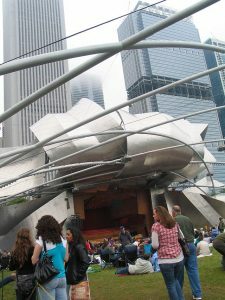 Then the Chicago Blues Festival is in the Jay Pritzker Pavilion (201 Randolph St.) in Millennium Park June 9-11. It’s free admission. Headliners include Billy Branch and the Sons of Blues with special guest James Cotton. Also headlining are Rhymefest, William Bell, Gary Clark Jr., Rhiannon Giddens and Ronnie Baker Brooks. For tickets and other info visit Blues. Next, is Ravinia, the wonderful outdoor music park in Highland Park. For the full schedule click Ravinia. John Legend’s “Darkness and Light Tour” is June 10. It opens with Grammy-nominated artist Gallant. The multi-Oscar-nominated film,”La La Land,” will be shown under the stars on large screens accompanied by the Milwaukee Symphony Orchestra conducted by George Stelluto on June 18. Gipsy Kings, a group that blends flamenco with pop and Latin rhythms comes Friday, June 23. The Moody Blues do “Days of Future Passed” June 30. OneRepublic & Fitz and The Tantrums are on stage July 14-15. Blondie and Garbage start their 2017 “Rage and Rapture” tour at Ravinia July 22. American Acoustic with Punch Brothers, I’m With Her and Julian Lage are Aug. 14. Tickets go on sale to the general public on May 9. Donors can request tickets March 22 depending on their giving level. For more information including early request dates. Visit Ravinia. In addition Pitchfork is collaborating with Saint Heron, for an art installation, film screening, artist talks, late night jazz jam sessions. Visit Pitchfork for tickets and collaboration sites.